A Wyoming Power of Attorney can assist you when you are seeking to have a loved one or another legally represent your interests in certain situations. There are many different types of POAs depending on your needs. There are some that allow you to appoint someone to have broad powers over your assets and property. There are others that allow you to select an individual with limited powers over a specific situation, such as having your vehicle titled. You will want to consult with your proposed representative to make sure they understand your wishes. 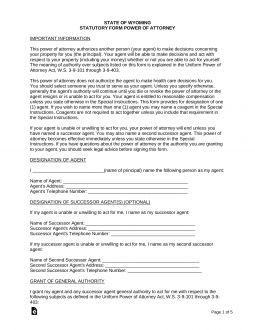 Durable Power of Attorney – You may use this form to appoint another to make decisions regarding your assets and property. The appointment will last until you either revoke it or pass away. It is called “durable” because your incapacity will not void it. General Power of Attorney – This form is similarly for appointing a representative to make determinations regarding your assets and property. However, this type automatically terminates if you, as the person who created it, becomes unable to make your own decisions. Limited Power of Attorney – This type can be tailored to reflect your needs and circumstances. It is used when you have a specific event or transaction for which you need representation. Medical Power of Attorney – A medical POA is useful in situations where you are unable to convey your health care wishes to your medical providers, such as an accident or surgery. You can tell your agent ahead of time what types of treatment you would prefer if the need arises and then your representative can convey those wishes to your doctor under a legally executed medical POA. Signing Requirements (§ 35-22-403): Notary public or two (2) witnesses who are neither the treating health care provider or their employee, the attorney-in-fact, the operator or employee of a community care facility, or the operator or employee of a residential care facility. Minor Child Power of Attorney – Used for the election of an individual to handle the everyday care for a child of another person. Signing Requirements: It is recommended that the document be signed by the caregiver and two (2) witnesses before being notarized. Real Estate Power of Attorney – To elect someone to handle the decision-making for the conveyance of or management of real property. Revocation of Power of Attorney – This form is used when you seek to terminate a previously executed power of attorney. Make sure that you let anyone know, including your agents, that you have terminated by providing them with a copy of this revocation. Signing Requirements (§ 3-5-103): Unless stated otherwise in the Power of Attorney, a Revocation document created before January 1, 2018 may be executed either using the same method of execution as a Power of Attorney created on or after January 1, 2018, or by filing the Revocation document with a copy of the Power of Attorney attached, in county clerk’s office where the principal resides. Tax Power of Attorney Form – The State of Wyoming recognizes the Federal Tax Form 2848 for all power of attorney tax purposes. Vehicle Power of Attorney – A limited POA that only applies to dealing with your motor vehicle in front of the Wyoming Department of Transportation.